Today I found out where the word “jaywalking” came from. For those not familiar with this term (i.e. many people outside of the United States), jaywalking is when, “A pedestrian… crosses a street without regard to traffic regulations.” (OED) For instance, depending on where one lives, it may be against the law to cross a street where there is a crosswalk nearby, but the person chooses not to use it. Alternatively even at a crosswalk, it is often illegal to cross if there is a “Don’t Walk” signal flashing or the like. The term was also mentioned in a 1915 New York Times article where they stated they found the term “jay walking” “highly shocking” and “truly opprobrious” (shameful). This was in reference to the way it was used at the time, akin to a racial slur, but in this case more of a pejorative “class” term. Specifically, a derogatory term against poor people by people who were wealthy enough to drive. Automobile related companies popularly used this term in various anti-pedestrian campaigns. For instance, John Hertz, president of Yellow Cab, even went so far as to say, “We fear the `jay walker’ worse than the anarchist, and Chicago is his native home.” Chicago is still noted today for rampant jaywalking among the populace. 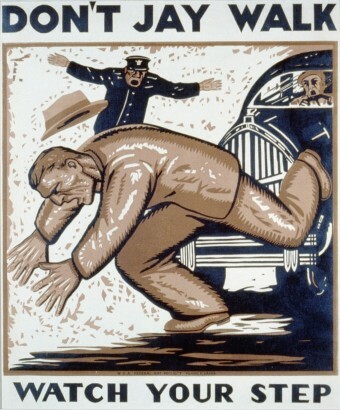 In order to counter the automobile interests who were trying to get pedestrians off the road, for a time the term “jay drivers” was used as a derogatory term for people who drive cars in such a way as to hog the road or pose a danger to pedestrians. This obviously didn’t catch on and, in the end, the automobile companies won the fight for use of roads. The interesting thing about the “safety” factor of crosswalks vs. jaywalking is that it isn’t entirely true. As noted in an article a few days ago, recent studies have shown that pedestrians actually are about 28% less likely to be hurt while crossing a street if they jaywalk, rather than cross at a crosswalk that doesn’t include any additional signals like traffic lights. This is thought to be the case because people who jaywalk tend to be more careful when crossing the road than those who are crossing in crosswalks. In the early days of public streets in the United States, roads were legally to be shared equally between cars and pedestrians. Due to the danger this posed to pedestrians, particularly when automobiles became common, this changed to roads being nearly exclusively for use by vehicles. Although, especially recently, pedal bikes are beginning the process of re-claiming use of the roads in some areas. Despite the fact that jaywalking as been shown to be safer than crossing at crosswalks that don’t have additional signals like traffic lights, 3/5 of all pedestrian deaths on the streets of the United States occur outside of crosswalks. The word “jay” comes from the Old French “jai” meaning “gay, merry”, which in turn comes from the Old Frankish “*gāhi”, meaning “quick, impetuous”. This Old Frankish term comes from the Proto-Germanic *ganhwaz, meaning “sudden”. The common crosswalk “painted stripe” pattern is known as a “Zebra Crosswalk”. Love your postings. Very cool reading about the origins of things like this. Any idea where the term “crackpot” comes from? If I had to guess it would be referring to utility. A cracked pot is useless…hence the insult. Excellent. That was a very generous explanation on the origin of ‘jaywalker’. I had always wondered what could ‘jay’ possibly mean. The Jay in the “jay” walking is a kind of bird. The jay bird produces a very irritating and annoying sound that people who cross the street improperly are called by that term because of their annoying actions. So jay walking means annoying walking. Regarding the Green Cross Code, how is it “superior” that British children must be told to “Think”?